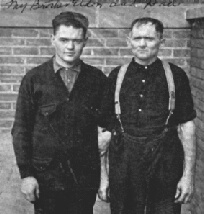 Eldon's parents were farmers near Lansing, MI. On the back of the picture above right of Eldon at age 16 is the handwritten note: "notice how much he resembles his mother at the same age." Eldon served as a mechanic in the U S Army Air Corps in the Philipines in 1926-7. 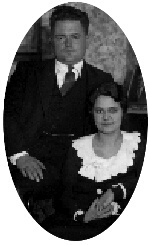 Eldon married his wife in the Lansing, MI area and the family moved east in the early 1930's. They lived both in NY and PA. Their first child was born in New York City. Eldon was 31 years old when he was killed in a plane crash. At the time, he and his family lived in Altoona, PA. The crash occurred near Sunbury, PA. 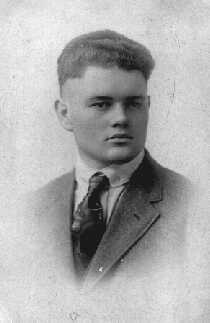 He had stopped for a pilot training lesson in Sunbury enroute from Altoona to Trenton, NJ where he worked as an automotive engineer for the Socony Vacuum Company. The "Great Lakes Trainer" airplane was caught in a downdraft and crashed in a field near the airport.